Jean-Paul and Jeanne-Marie Beaubier were not your average set of twins. During their adolescence, they each separately fond that they possessed the mutant abilities to fly and travel at superhuman speeds. They have since discovered that whenever they join hands, they produce a radiant strobe effect, often blinding their adversaries into submission! 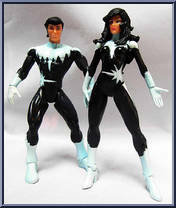 Putting their respective lives as a professional skier and history teacher behind, "Northstar" and "Aurora" joined Alpha Flight, Canada's very own super heroes. Contribute pictures, update details or suggest corrections for Northstar / Aurora. Write a review about Northstar / Aurora.